Scania is one of the world's leading manufacturers of trucks and buses for heavy transport applications, and of marine, industrial and power generation engines. Our strategic focus is on customer profitability by providing sustainable transport solutions, long-term customer commitment and premium products & services. In Scania Malaysia alone, there are more than 250 people employed across the country in sales and service branches, mobile workshops and Scania Assistance standby service vans. We are also staffed to provide financial services through Scania Credit Malaysia. We are also present in neighbouring Singapore, Brunei, Myanmar, Vietnam, Philippines and Thailand; all of this to provide cost-effective transport solutions and maximum uptime to our customers. 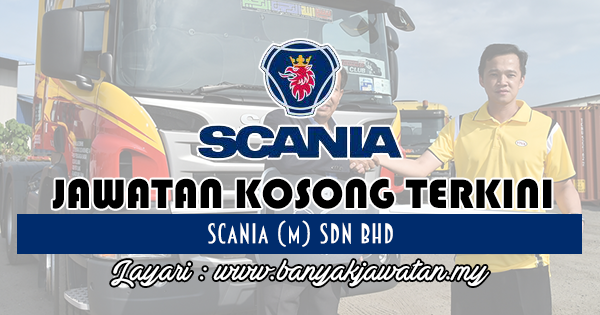 0 Response to "Jawatan Kosong di Scania (M) Sdn Bhd - 8 Ogos 2018"